A few key points on this video. First, note that anti-healthcare-reform “tea partier” after “tea partier,” when asked, can NOT name specifics in the bill (or anywhere else) to back up their heated rhetoric/talking points. Second, note that when asked where they got their information, it’s from totally biased (which they admit when asked) sources like “Fox News” and not from actually reading and understanding the legislation. Third, note how time and again, tea partiers in this video simply deny facts they find inconvenient, like the FACT that there are 30 million people without health insurance in this country. Fourth, note that lack of compassion, for instance that people without health insurance should just “go to the hospital.” Fifth, note the cult-like worship of Glenn Beck and his “principles.” Finally, note the excellent job the interviewer does in trying to pin these people down and letting them attempt to respond. It may not be a “circus,” exactly, but it sure is funny at times. If you find “dark” and “disturbing” to be funny, that is. P.S. 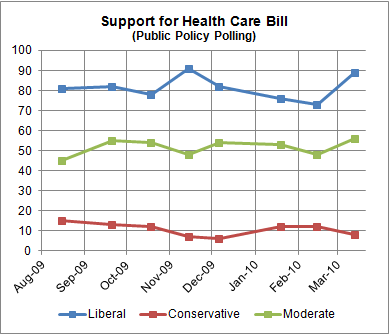 Check out this graph, courtesy of Nate Silver at 538.com, which demonstrates that conservatives are moving in a completely different direction on health care reform as liberals and moderates in this country. Gee, I wonder if 24/7 echo chamber brainwashing by Faux News, Rush, Glenn, etc. might just be causing that. Hmmmm. UPDATE #2: See Paul Krugman’s “Why We Reform” for an intelligent, well-informed argument (the exact opposite of what we see in the above video) why we need health care reform now.